It isn't as easy as copying and pasting is it?? No. You have to find a site to host the pic. Then the site will give you a link to your pic, which you paste into the reply window, and that should work. It isn't that complicated, should only take a minute to set up. Never noticed that, lol. It works too, cool. holy wheelgaps batman! no, the car is not on jacks or stands. first pic is of the rear, second pic is of the front. who wants to go 4x4'ing with me? umm trd sticker doesn't make it a trd wheel, but i could be wrong...and why a wider tire on the rear of a front wheel drive car?? ^ its not a sticker, TRD is embossed into the lip of the wheel. 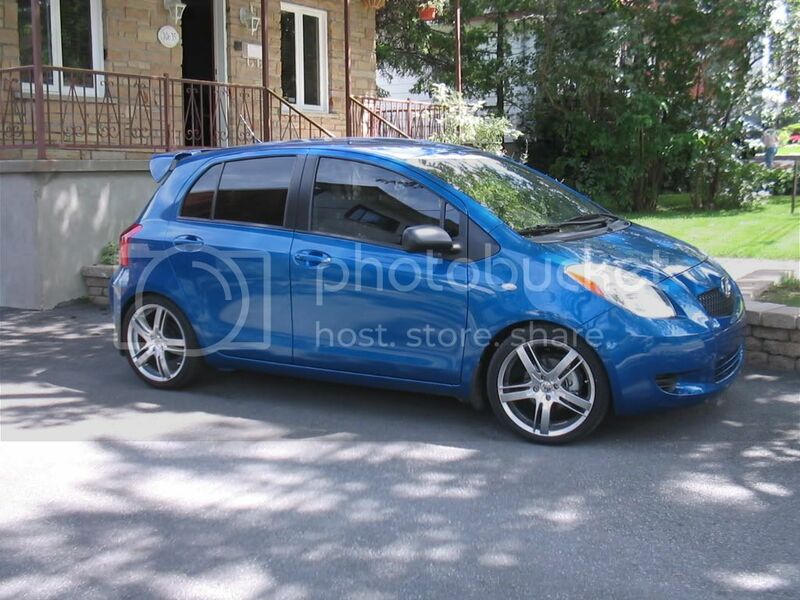 Here is my Yaris with 20% tint and I added mudguards. I am going to mod it slowly while enjoying owning a NEW car. I like the mud guards, I'll have to get them for my next option. Anyways here is my Yaris. Sweet! I got blazing blue too - lovvve the color! When I saw those rim options on the website at access toyota I wasn't too sure about them, but now that I see them on your car - WOW!!! did you get the car lowered?